The process of designing and manufacturing seals for industrial usage has quite different approaches. Since industrial seals are often exposed to a wide range of challenging operating condition, they are often design by referencing industrial standards and environment condition regarding where the seals will be used within the operating mechanics. The evaluations of the environmental and industrial standards references are critical in the seal manufacturing designing process. Each of the acting factors must be taken into account in order to produce high quality seals with effective sealing solution. Temperature, pressure, shaft oscillation, and polluting media are some of the common acting factors that need to be considered during the designing process. Seals widely used in industrial devices are such as gearbox, reducers, motors, and pump, etc. 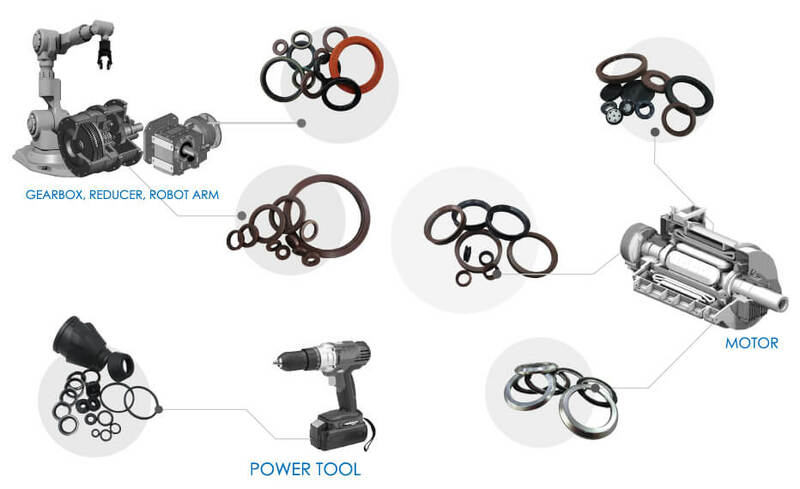 At WINTEK, we dedicated in developing and designing high quality and effective sealing option for rotating, reciprocating, and static industrial application. Wide range of materials selection offered by WINTEK helps customers overcome barriers and limitation. WINTEK’s innovative and thoughtful design sealing solution will help increasing your productivity and operation reliability. Fully covered FKM seal, the design is similar to type 01, only internal metal case surface is fully covered by VITON rubber to protect from the corrosion of medium (Ex. Organic solvents, chemicals...). The design of fully covered seal can be used in industrial application. Double main lips with springs loaded design is suitable for the application which requires to seal and separate two media. It is also used for high contaminate application. Type 50x series with convolute flex section design is suitable for high eccentric and high run out conditions. End caps are commonly used in gearbox cases with multi-shaft input/output combinations. Axial face seal is a combination of the high speed capacity of standard mechanical seals with the simplicity of radial lip seals. Agricultural equipment, electric motors, and wheel hubs are the typical applications that axial face seal can work on its performance. RE and RE 1 type are available. V-seal is an all rubber product which is fixed on the shaft and axially against a perpendicular counter face to create the sealing function. V-seal can be utilized as either a primary or backup seal and perform an excellent sealing job. V-seals are available in WINTEK with Nitrile (-40℃~100℃) and Viton (-40℃~200℃).